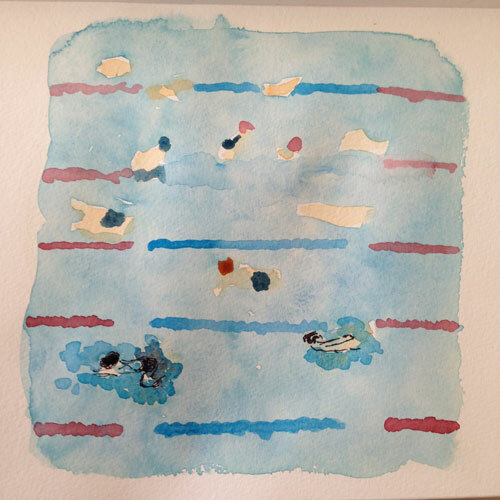 Have you seen my Swimming fabric? Interested in making something with this fabric? Order it from Spoonflower. See my other fabric print designs here. Categories: Illustration, Sketch | Tags: pool, relaxing, summer, swim, swimming | Permalink. 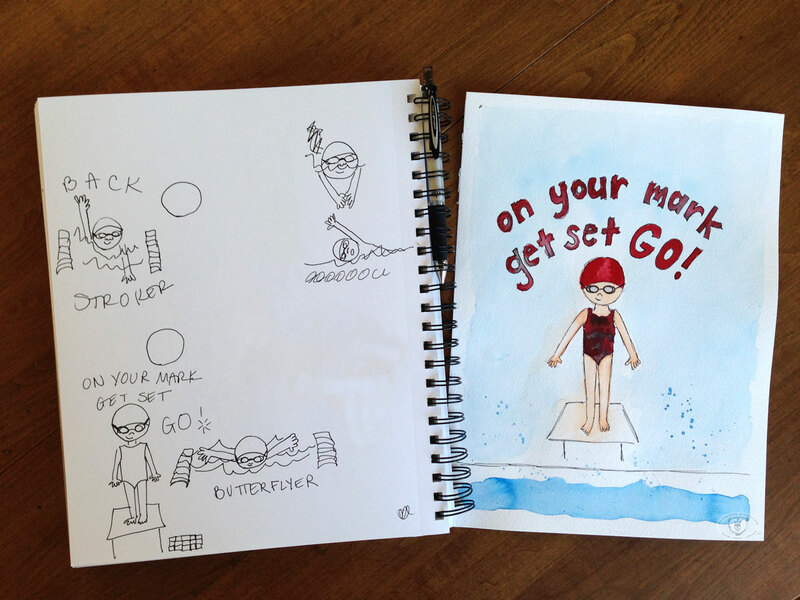 It feels really good to finish something that I have wanted to do for a long time – paint a pool. I have loved pools since I was a little kid, especially outdoor pools. I grew up in a beach town (I know poor me) and our local pool was an indoor pool. 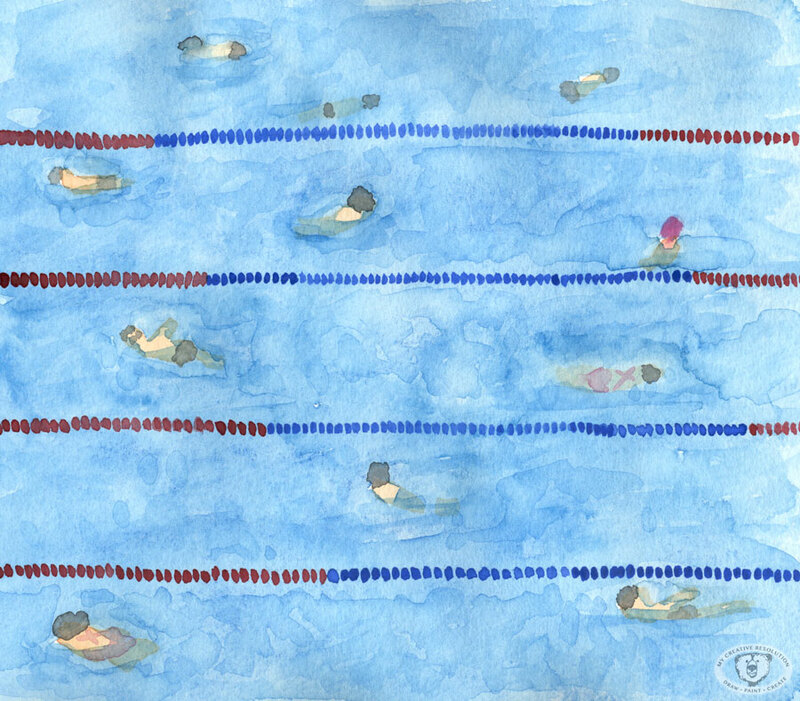 I was a swimmer and occasionally during the Summer we would go to a swim meet at an outdoor pool. I thought I’d died and gone to heaven. 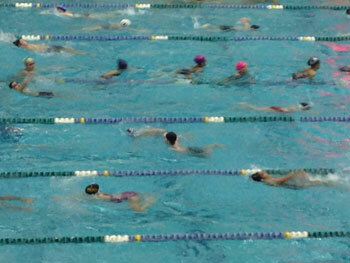 My kids are lucky enough, during the Summer, to have practice and all their swim meets at outdoor pools. Our pool even has a high dive. Spoiled kids! 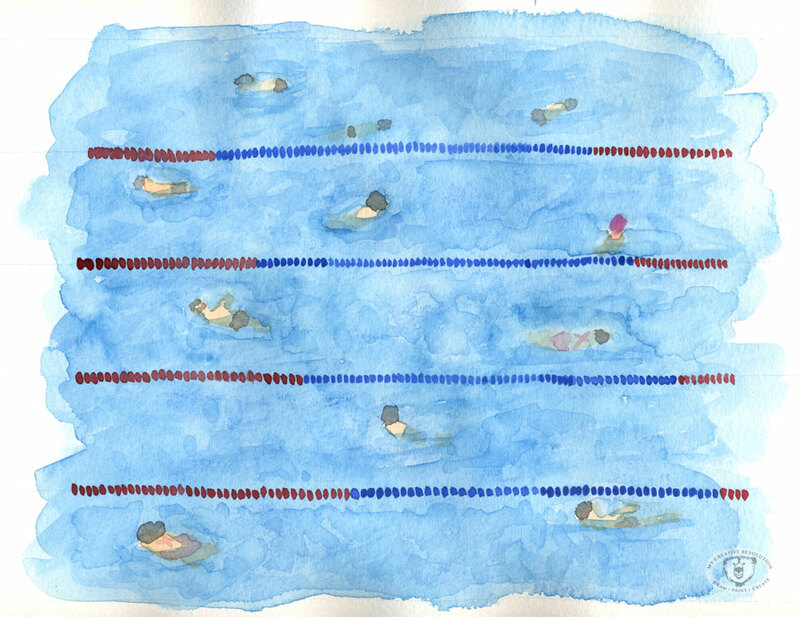 During the Summer, while I watch my kids practice I always think about painting the pool and the swimmers. I’ve taken pictures, started, sketched, but I always struggle early on and never finish. Yesterday I gave it a try. 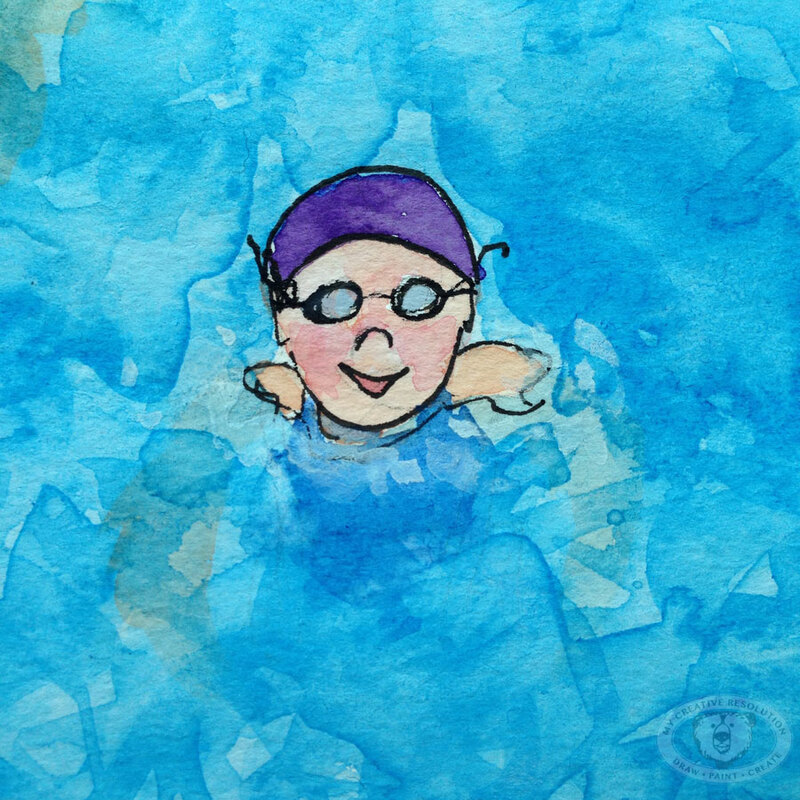 I realized that if I did the bodies first and painted the blue over parts of the body, that part would look like it was underneath the water. In this first version I didn’t like that you couldn’t see one of the lane lines (the kids are sitting on it in the photo). The lanes were also uneven. And once I added the ink, I didn’t like it at all. I decided to try again. 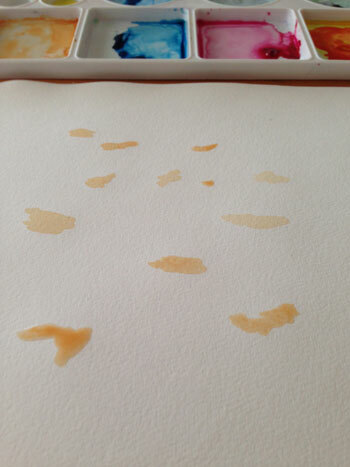 I see my willingness to “try again” as growth as an artist. I used to sit down and expect to get it right the first time. Can you imagine if a photographer only took one photo! I now know that I need to warm up, try things out, not get discourage, and keep working and trying. I purposely kept things simple without a lot of detail. Both my sons liked my first attempt better! But I like the second one. I’m hoping to do more of these, now that I finally got started! 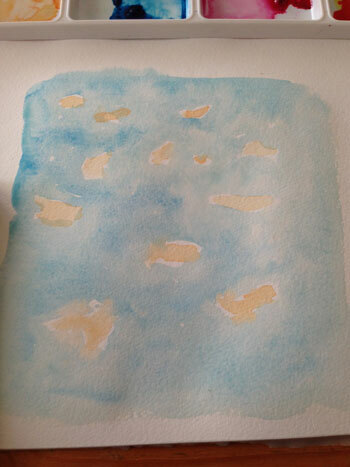 Categories: Watercolor | Tags: Art, illustration, painting, pool, swim, swimming, watercolor | Permalink.